Ava DuVernay’s Selma (2014) is a great American film. Gripping, powerful, and tragically relevant. It’s difficult to separate it from recent racially motivated events, but that’s what makes it so important. The fact that what’s portrayed took place five decades ago and that lines can be drawn to modern times shows how far we’ve come as a society, and how much further we still have to go. This is not just a history lesson but also an examination of a people who faced difficult challenges just to attain their basic constitutional rights. It’s passionate and urgent, filled with the anxiety of a thriller. David Oyelowo accomplishes the near impossible in the role of Dr. Martin Luther King Jr. Perhaps the most important American figure of the 20th century, Oyelowo doesn’t perform an impersonation of Dr. King as he does embodying his spirit. Oyelowo doesn’t look like the great civil rights leader, but he encompasses Dr. King’s charisma, his presence, and his ability to galvanize people through speech. But there’s no sanctifying going on here. Dr. King is shown as a fully formed person, full of doubts and insecurities. He questions his ability to continue with his movement, often times needing reassurance from his friends and family. In a scene with his wife Coretta (Carmen Ejogo) we learn of his infidelities. This was not something I was aware of going in. One of the many accomplishments DuVernay, Oyelowo, and screenwriter Paul Webb achieve here is depicting Dr. King as who he was: human. We open in 1964 as Dr. King accepts his Nobel Peace Prize award. This is set as a stark contrast to the rest of the plot, where he and his followers find extreme difficulty in creating peace in America. We quickly move into 1965, where his focus turns to Selma, Alabama, particularly with voter rights and protections. Black citizens were given the right to vote by this time, but pressure and intimidation from local registrars prevented them from being able to. With the Johnson administration hesitating to provide immediate support, the choice was made to organize a peaceful protest; marching from Selma to Montgomery in demonstration. This decision comes with resistance both in its philosophy and in the potential for violent retaliation. With a screenplay that mostly has characters talking and debating, DuVernay and Webb infuse a significant amount of tension and suspense. This is handled through the interaction between Dr. King and President Lyndon B. Johnson (Tom Wilkinson). It’s a face off between two powerful forces: King urging a new voting law to be passed immediately and Johnson’s reluctance to do so. With other issues hanging over his head (such as the Vietnam War and his stance against poverty) Johnson – depicted here – pushed the Civil Rights Movement as a secondary thought. But the mounting protests and unnecessarily brutal reactions of the local authorities (such as the televised “Bloody Sunday” event) forced Johnson to switch his priorities. It’s fascinating to see how the government perceived the movement at the time. Dr. King and his followers are described as “militants,” and drew the attention of J. Edgar Hoover (Dylan Baker) and the FBI. One interesting detail is the frequent use of annotations describing the actions of Dr. King, which appear to be taken straight out of the federal report. But the real power here is not in the historical elements but in the more personal, intimate scenes. Time is dedicated to small supporting characters, whose impact draws significance. 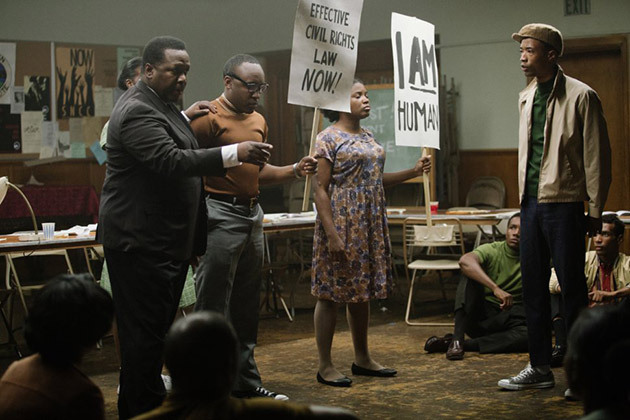 Characters like John Lewis (Stephan James) and Cager Lee (Henry G. Sanders) leave resonance in how the movement affected people on an emotional level. It’s their scenes that affected me the most. A lot of familiar names occupy other roles, such as Oprah Winfrey, Common, Wendell Pierce, and Cuba Gooding Jr. 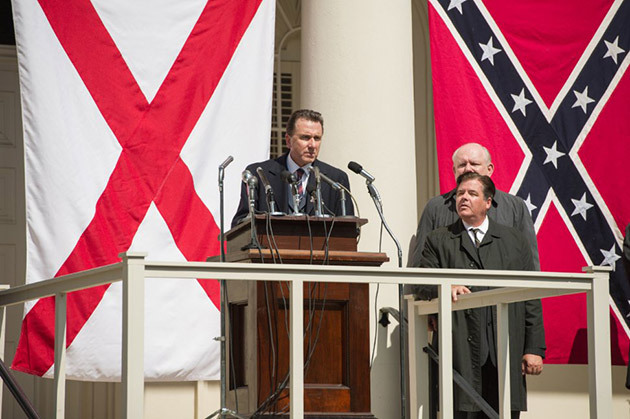 Even actors that play part of the oppressive authority – like Tim Roth as Alabama Governor George Wallace – are excellent as well. By putting known names in smaller parts, and highlighting people some may not even know of, DuVernay and her team injects a level of importance throughout all facets. It’s as though they’re saying every person was a crucial piece of the whole picture. If there are any missteps, it’s in the use of music. The musical choices are not bad themselves – the issue is in their placement. DuVernay falls for the familiar trap of laying a musical piece over an emotional scene, like when Dr. King delivers a rousing speech. This is unnecessary, as the writing and performances are already powerful enough to stir us, we do not need background music telling us how we should feel. It’s a very minor quibble in the overall scope of things, and I wonder if many would even notice it. Selma should be required viewing in all schools. It’s a document of one of the most crucial times in history, where one wrong decision could have destroyed all the progress made up to that point. The acting is exquisite, and DuVernay directs with a sure and confident hand. It’s not only the story of Martin Luther King Jr.; it’s the story of the American People.